Bill Long and Bill Hanvey talk vehicle data access at Vision 2019. In the fight for access to the treasure trove of data generated by new vehicles, failure is not an option for the automotive aftermarket. That was one of the key takeaways from a presentation at the Automotive Aftermarket Suppliers Association’s (AASA) 2019 Vision Conference in Dearborn, Michigan. Bill Long, the newly minted president and CEO of the Motor & Equipment Manufacturers Association (MEMA) [and longtime president and COO of AASA], called data access “the top must-win issue” for the automotive aftermarket. “Some might refer to it as telematics. Some might refer to it as data ownership. Some might refer to it as Right to Repair. And in our view, at the end of the day, the goal is to ensure that motorists have the right to maintain their vehicles and have them serviced where they want and with the parts they want,” Long said. Bill Hanvey, president and CEO of the Auto Care Association, joined Long on the stage. 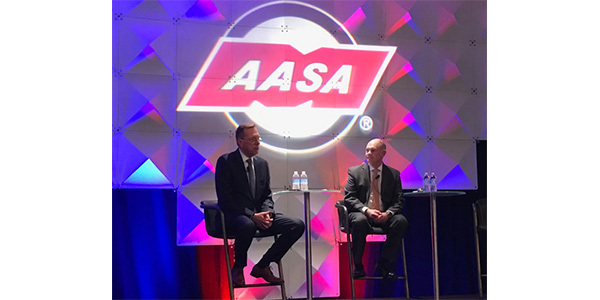 Long emphasized that AASA – MEMA’s light-vehicle aftermarket division – and the Auto Care Association are aligned in their position on data access. The Auto Care Association has been one of the most prominent. The association scored a major victory in Massachusetts with the passage of H 3757 in 2013. The legislation, which the association calls Right to Repair, paved the way for a 2014 national memorandum of understanding between the Auto Care Association, the Coalition for Auto Repair Quality (CARE) and automakers. In the memorandum, the OEMs agreed to make the same service information and tools available to independent repair shops that they provide for their franchised dealers. However, the 2013 Right to Repair legislation didn’t address telematics – the umbrella term that encompasses the repair and maintenance data generated wirelessly by today’s connected vehicles. At the time, neither the automakers nor the aftermarket had a firm grasp on the definition of telematics or its potential, Long noted. The automakers have staked their claim to the data, placing aftermarket repairers at a competitive disadvantage. In late 2018, the Auto Care Association and CARE introduced legislation in Massachusetts that would require automakers to create a standardized “open-access platform” for telematics data in vehicles, and, starting with the 2022 model year, allow vehicle owners and lessees to access that data with a mobile device. The bill also would require the state attorney general to notify consumers that they have the right to allow independent repairers to access telematics data for the repair of their vehicles. The groups are running ads in Massachusetts to raise awareness of Right to Repair and to educate consumers on their right to access and control the telematics data generated by their vehicles. At the time of the AASA Vision Conference, the legislation had 55 co-sponsors. “We figure we need about 100, so we feel that we’re in pretty good shape,” Hanvey added. Hanvey expects fierce resistance from the automakers, who have “hired a significant number of lobbyists” in Massachusetts to fight the legislation. The aftermarket’s response to the challenge is the Secure Vehicle Interface, or SVI, a series of ISO standards allowing cybersecure access to a vehicle’s data. Compatible with intelligent transportation systems, the SVI “allows cybersecure, bidirectional communication with the vehicle,” according to Hanvey. Legislation is just one part of the fight to enable consumers’ access to their vehicle data. Long urged aftermarket participants to offer their support for the cause on other fronts. “We need to show the motoring public that we’re prepared and we’re ready for the connected-vehicle transformation,” Long said. That could involve establishing requirements for an ASE-certified connected-car technician, he added as an example. “When you download that diagnostic information onto a laptop or even a diagnostic tool in an independent repair garage, how do we ensure that it’s protected?” Long asked. Given that there are some people in the aftermarket who still might not be aware that data access is an issue, Long said the industry needs to spread the word and raise the awareness level among industry stakeholders and consumers. “It’s incumbent upon us in this room that we educate our staff and our consumers about not just the threat, but the opportunity that this data brings to all of us,” Hanvey added.